Symbolic or Religious Ceremony ? A wedding ceremony represents the promise of love between two people. The only difference with regular wedding ceremonies is that symbolic ceremonies are not religious. However, reading passages of religious texts are allowed ! 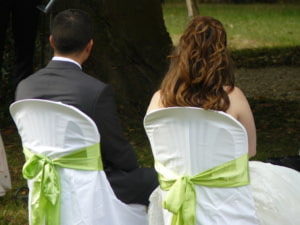 The advantage of symbolic ceremonies is that they are fully customizable, and our work is to make them matching you. Wether you are an atheist or a mixed couple, you can have access to a very romantic ceremony to proclaim your love in front of your loved ones. The symbolic ceremony is made for you in addition to a civil ceremony at the Town hall. But most of the times, it is about signing papers, and only takes ten minutes… You deserve a real ceremony ! You can get married at home, and then escape in France to celebrate your love worthily. Many venues are available; by the sea, in a cosy mountains chalet, at the foot of an oak, in a park, a museum… France is full of different landscapes, and you are free to choose your favorite one ! 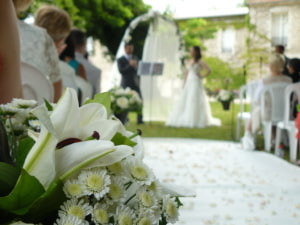 Intimate elopement or big event, we organize the perfect ceremony according to your needs. How to prepare a Symbolic Ceremony that matches you ? With you, we come up with, prepare and design your ideal ceremony, reflecting your aspirations, beliefs, traditions and origins. 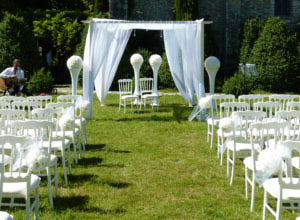 On the D-day, we are present to set up the decoration, welcome your guests, and manage the advancement of the different stages of your ceremony, constantly linked to the wedding officiant and the different providers. To talk about your event, do not hesitate to contact us !